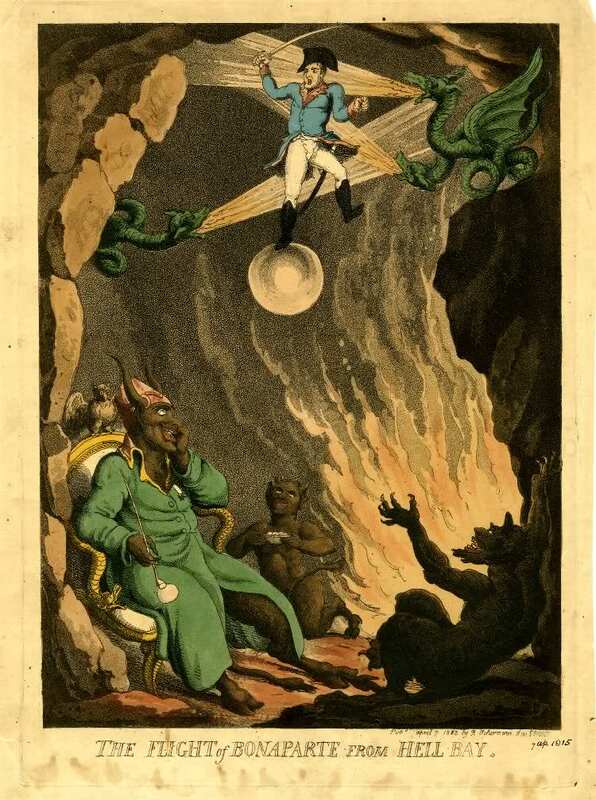 Fair warning – none of these have anything to do with Napoleon in Hell. Just liked the image. 119.52. Silver Plates: Somebody has dropped two silver plates in this hex. Characters have about a 1% chance of coming across them on their travels. The plates depict angelic beings in chains bound to large stones. The delicacy and artistry of the plates is astounding, and has an arresting effect on a person’s attention if they fail a saving throw to resist the effect. A person so drawn to the silver plates finds the plight of the fallen angels more and more compelling, and, if they encounter such angels (i.e. devils) later will suffer a -3 penalty to save against any charm or compulsion effects by them. The plates are worth 300 gp. 36.11. Necromanteion: Necromanteion is the terrible city-state of Gorgyra, the nymph of the Acheron. The city is a great dome set atop black, volcanic glass that floats above or under the Acheron as Gorgyra wishes. The interior of the city features five small harbors connected by narrow canals inhabited by demonic nixies. Between these canals and harbors there is a city of spires spun from black glass. Eerie music floats within this crystal wonderland, forcing people here to pass a saving throw each day or lose one important, happy memory (and one point of Charisma). The towers of the city are mostly empty. Each has a narrow entryway flanked by caryatid columns of transparent glass. Vultures wing through the air here and perch on the towers and fish people guide gondolas through the canals. The fish people are Gorgyra’s children, being polymorphed from the normal, bloated white fish that swim in the murky Acheron. They are given the souls of shades who have been swept into her domain (one soul in ten is her property by right), these souls being kept in crystal spheres worn on silver chains around their necks. These shades are collected by the fish men when they leave the dome (although it appears to be solid glass, it can be passed through by Gorgyra’s servants) in their sleek, black galleons. These galleons can submerge or even fly about 20 feet above the surface of the Acheron as the fish men like. Each galleon has a crew of twenty. Gorgyra’s palace is the largest spire in the dome that is located in the center of the dome. Here, she holds court before her people and her priestesses, female drow who have been transformed by their mistress. They now have skin covered in silvery scales and gills, as well as webbed fingers and toes. Gorgyra’s throne room measures about 50 feet in diameter with a 100-ft ceiling. The walls are the same black glass one sees in the rest of the city, though here the walls are covered in bas-reliefs of weeping women and drowned men. These sculptures leak salt water from their eyes or mouths, the water pooling on the floor about three feet deep. FISH MAN: HD 2; AC 3 ; Atk 1 bite (1d4+1) and 1 weapon (1d6+1); Move 12 (Swim 24); Save 14; CL/XP 4/120; Special: Slimy skin, immune to illusion, poison and paralysis, half damage from lightning, light sensitive. FIENDISH NIXIES: HD 1d4 hp; AC 7 ; Atk 2 claws (1d4 + poison); Move 6 (Swim 12); Save 18; CL/XP 1/15; Special: Charm, magic resistance (10%), poison claws (save or 1d8 damage). GORGYRA: HD 9 (72 hp); AC -1 ; Atk 2 claws (1d8) and bite (1d10); Move 24 (S24); Save 14; CL/XP 14/2600; Special: Sight causes blindness or death, deals double damage against lawful creatures, spells (cause disease, darkness, detect invisibility, dispel magic, haste, poison), immune to poison, resistance to fire (50%), +2 or better weapon to hit, regenerate 3 hp/rd, magic resistance (50%). 8.52. Grasping Hand: In the midst of the grasslands there is a portion of ground that looks as though it has been recently burned. Should somebody step into the middle of this burnt area and speaks the name of a place within Hell, an enormous clawed demon hand erupts from the ground beneath their feet and grasps them tightly. It rises in the air, supported on a scaly arm, and then hurls the person bodily towards that place. The landing, unless the person levitates, flies or uses feather fall, inflicts 10d6 damage, and the hand itself inflicts 1d10 points of damage. This is shaping up to be the ultimate hellbox!